Preschoolers are fascinated with numbers and shapes! As many of our readers know, all groundwork for future math success must begin in the formative years of early childhood. While we are champions of pure play, adult guidance is necessary to help preschoolers establish real and lasting relationships with mathematical concepts. As teachers and parents, we must observe, communicate, and help our children explore, visualize, and relate to math concepts frequently to promote early math skills and intuition with preschoolers. 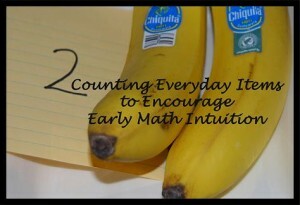 This post is part of a 4 part-series on Early Math Concepts that will help encourage preschoolers to develop good math intuition and a base for future math skills. While knowing how to count up in sequential order is important for children, counting up and knowledge of the counting sequence does not mean that a child has a real relationship with numbers (similarly, memorizing the ABC Song does not indicate that a child has a real relationship with letters). There are 6 number concepts that preschoolers should have opportunities to explore in order to develop good math intuition! This post will concentrate on the first three: Number Awareness and Recognition, One-to-One Correspondence, and Subitizing! Number awareness and recognition begins even in infancy. Reading and singing numbered songs and fingerplays (for example: “5 Little Ducks”) create wonderful opportunities to incorporate early math into daily play. Through physical/verbal engagement and interactions, small children become aware of numbers and eventually are ready to work on number recognition activities. Parents are a child’s first teacher; some parents may not even aware that their daily interactions with their children are teaching early math concepts! Labeling and counting objects around the house is a great place to begin: How many eggs are in a carton? – label the egg carton cups with a permanent marker for visual prompts. How many toys in that bin? – count at various times throughout the week and write the number down. Setting the table and counting cups/plates/silverware as they are laid out is another great way to incorporate early math. Daily discussions and trips can include early math number recognition: How many days in the week? What number of items do we need at the store? Our house numbers are…? How many books have we read today? Daddy/Mommy will be home when the clock displays what numbers? By incorporating early math concepts into daily routines, even the youngest of children will begin to develop early math intuition! One-to-One Correspondence is the knowledge that a certain number relates to a specific quantity of objects. The goal is to help preschoolers gain confidence not only with number recognition, but to help them move beyond just recognition and toward the question: How many items make up any specific number? Materials needed: Cardboard tubes, pompoms, and a permanent marker or number stickers. For young children, begin with a few numbers only. Our children decorated the tubes and added number/quantity stickers, but a permanent marker can be used to label the tubes if desired. Prior to individual practice, an adult should stand the tubes up on a table or tray. Beginning with just one number, invite the children to say the number, draw over the number on the tube with a finger (for tactile support), and set out the quantity of pompoms that corresponds to the number. If the child is having trouble with a particular number/quantity, stop at that number and practice until the child is consistently able to match the number to a specific quantity of pompoms. As the children gain confidence, make a tray with the cardboard tubes (set the tubes up in SEQUENTIAL number order to begin and move toward RANDOM number order) and pompoms for individual practice. Our kids use tweezers to transfer the pompoms to the top of the cardboard tube and “drop” the corresponding number of pompoms into each of the numbered tubes. The activity above is just ONE of many activities that encourage one-to-one correspondence skills. If you are a teacher/blogger/parent and would like to share your own post(s) or ideas with our readers, please comment below! Subitizing is the ability to instantly recognize small quantities of objects. The ability just to KNOW how many are in a group requires practice and adult guidance. Daily discussions and interactions can greatly enhance subitizing skills. To help young children, focus on groups of 5 or less in the beginning. Math does not need to be limited to tangible concrete manipulatives for children to understand, but using manipulatives in the beginning adds the extra tactile layer many children need. 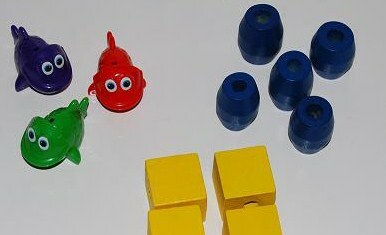 Look around the house or classroom for items found in small groups: mittens, socks, canisters, small manipulatives can be placed into groups (as in the photo above), dice and dominoes, play dough pieces, or anything that can be grouped together. In the beginning it is helpful to young children if the items are similar. Later, as the children gain confidence, group different items together. Playing, counting, and subitizing: make the small groups of items and count each of the groups with your child. Invite your child/students to count independently and observe counting successes or errors. Ask your child to pick up each item as they count and set it back down before counting another item. When your child is able to count a group correctly with consistency, we can progress to visual scanning for mental math. Ask your child to visually scan small groups of objects or roll dice/use dominoes for further practice. As the children practice with various games requiring quick visual scans, your kids will become pros at subitizing. Disclosure – this post and others within the blog contain affiliate/distributor and or sponsored content. Please see our disclosure page for full details. 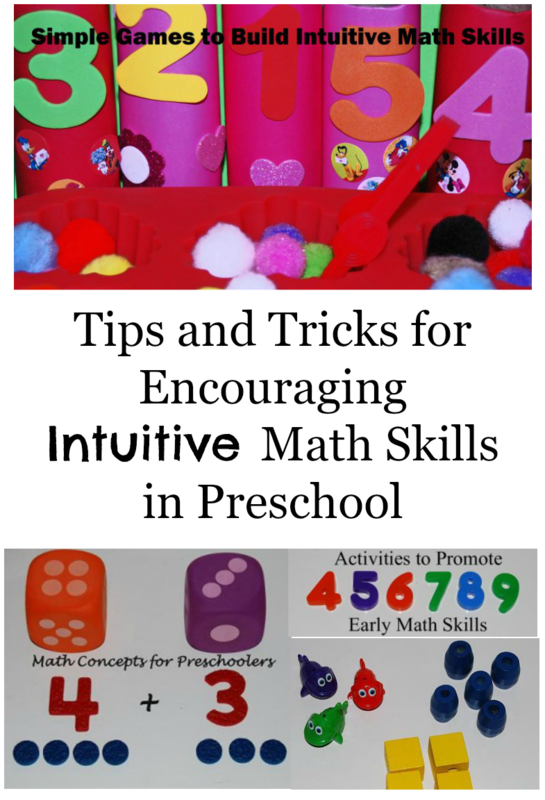 Please join us as we share more math concepts and suggestions to help build good math intuition in preschool! 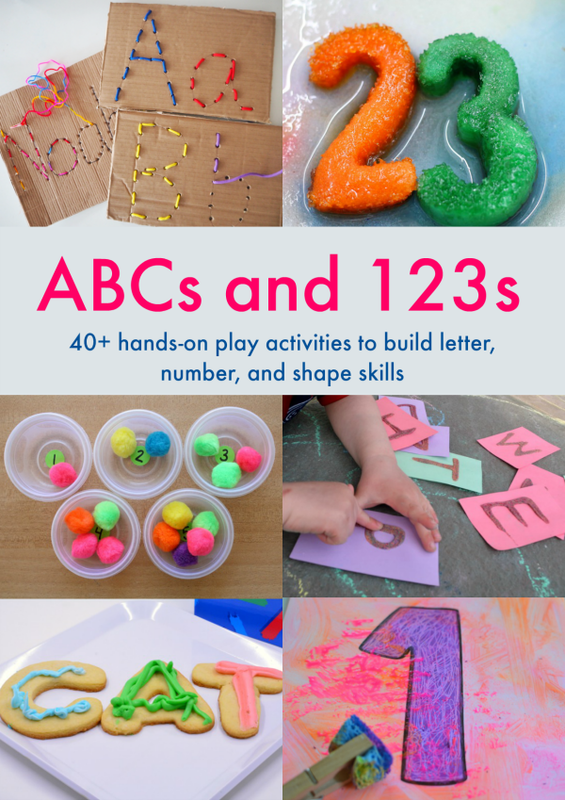 Our newest collaborative eBook, ABC’s and 123’s will delight your preschoolers with hands-on, playful learning with NUMBERS and LETTERS. 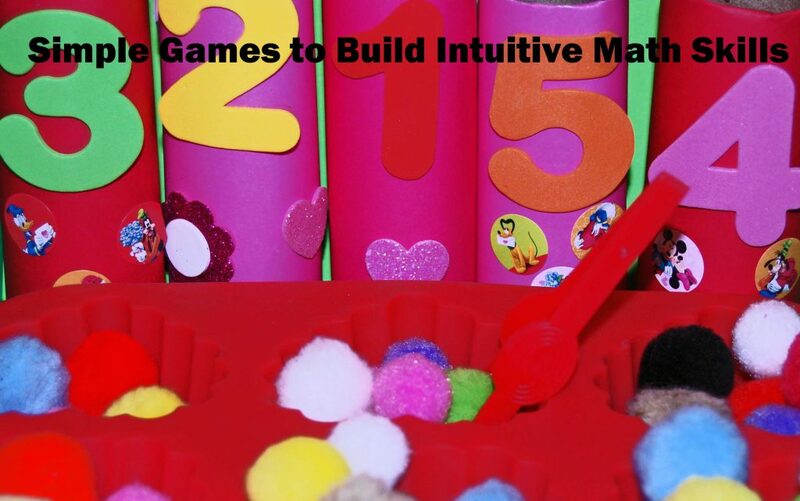 With over 40 ways to play, intuitive math (and literacy) comes easily for young kids! This is an eBook, which means you will be sent a link that allows you to download a PDF containing the eBook and all the resources. You can save it to your computer or iPad* and then either read it on screen or print some/all of the pages, as you prefer. You can buy the ABC’s and 123’s eBook PLUS the BONUS PACK for the SPECIAL DISCOUNTED PRICE of $9.99 (April 10 – May 7th, 2017) wherever you are in the world. You pay via PayPal, which will take care of any currency conversion for you. Please note: You can buy the eBook now, on any device, and then download it when you are ready. Depending on the apps you have installed and your operating system, you might be able to download the eBook on your mobile device. However, if you have any doubts or problems, I recommend you use a computer to download the book and then share it to your mobile devices. You will be sent download instructions when you purchase the eBook.